Interview with the artist in the context of her survey show that started in 2015 at the Pompidou. By Christine van Assche. After the Centre Pompidou in 2015, Mona Hatoum's survey exhibition has been on view at Tate Modern in London, from 4 May to 21 August 2016. From 7 October 2016 to 26 February 2017, it is shown at Kiasma in Helsinki, Finland. Mona Hatoum is curated by Christine Van Assche, Honorary Curator, Centre Pompidou, and Clarrie Wallis, Curator of Modern and Contemporary British Art, Tate, and Katy Wan, Assistant Curator, Tate Modern. The exhibition is organised by the Centre Pompidou, Musée National d’Art Moderne, Paris, in collaboration with Tate Modern, London and the Finnish National Gallery / Museum of Contemporary Art Kiasma, Helsinki. It will be accompanied by a catalogue from Tate Publishing and a programme of talks and events in the gallery. After staging the first museum exhibition dedicated to Mona Hatoum's work twenty years ago, the Centre Pompidou is now devoting its first major monograph exhibition to her, featuring a hundred-odd pieces, and covering the multidisciplinary aspect of her work from 1977 to 2015. Without any chronological order, similar to a "map" of her career path, the exhibition provides audiences with a journey through her output based on formal and sensitive affinities between the works. In this way, the performances of the Eighties, whether documented in photos, drawings or videos, are seen in relation to installations, sculptures, drawings, photographs and objects dating from the late Eighties to the present day. Christine van Assche: You spent 23 years in the Lebanon, where you were born, and you have lived for 40 years between Britain and Berlin. How do you situate yourself between these different cultures, between the Middle East and the West, or rather, how do you situate your work? 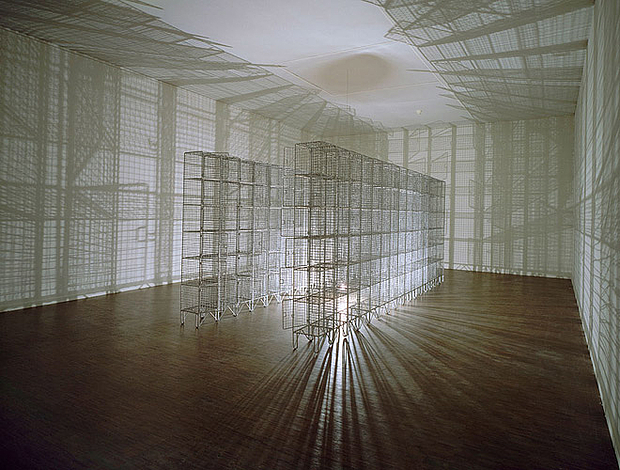 Mona Hatoum: I am not sure it is useful to think about my work in these terms. I find it unfortunate when people approach the work looking for connections to my geographical origins as it seems to limit the reading of the work and they miss out on the formal subtleties and complex experience the work can offer. My work uses geometry, abstraction and the formal language of art and the large installations I have created since the early 90s make reference to the architecture of power and control I have encountered in the West. My roots are in the Middle East. I spent all my formative years in Beirut, a cosmopolitan city where I did my studies in a French school before finishing them in an Italian school and then attending an American University. So I was subjected to quite an eclectic set of influences, even before I left Lebanon. This is typical of the post-colonial condition in the Arab and North African region, where so many different cultural influences produce a rich complexity in the individual psyche. I have now spent two thirds of my life in England and, more recently, have divided my time between London and Berlin. So I have had a hybrid cultural experience and a multifaceted existence and I think this is clearly reflected in the formal diversity and multiple approaches I use in my work. CVA: What do you mean when you refer to "the structures of Western power"? MH: Surveillance and being constantly watched by the eye of the state was one of the first things that struck me when I arrived in England. In the late 70s, my involvement with Feminist groups led me to examine power relationships first along the gender divide and then in race relations. I even saw the bureaucratic institution I was part of at the time (University College London) as a microcosm of colonial powers, and this led me to examine the relationship between the West and the ‘Third World’. I was at the time reading Foucault and Bataille and became very interested in the concept of the Panopticon and surveillance and other mechanisms of state control. CVA: All your work draws the spectator into a complex relationship, which is nonetheless different in the performances, sculptures and installation works. How are you developing this involvement? MH: I like to engage people in a visual and physical way at first so that the associations or interpretations emerge out of that initial physical encounter with the work. In the performances I had a direct rapport with the audience but when I started making installations, I wanted my own body to be replaced by that of the viewer. In the large installations, which can be quite enveloping, the viewer becomes enmeshed in the phenomenology of the space and the formal elements of the work to experience for themselves a feeling of instability or threat, for instance. With the sculptures, especially when they are in the form of domestic objects and furniture, the viewer can project their own body onto a work and imagine themselves using it. The fact that they have been transformed into unusable and threatening objects makes us question the safety of the world we live in. CVA: How are the performances presented in the exhibition? MH: A selection of performances – ten in total - are presented as documents in the form of photos, sketchbook drawings and descriptive texts. There are also four video documents of performances and all this, together with the vidéo works, represents most of the work I made throughout the 80s. These documents and videos will be dispersed throughout the exhibition offering a different focus and viewing experience next to the more formal and experiential installations and sculptural works. CVA: You have produced several videos that were not linked with performances. Do these correspond to a certain period in your career, or to certain specific explorations? MH: In the 80s, alongside my performance work which often included a live video element, I produced several video works which were an extension of the time-based and narrative genre of work I was making at the time. The first of these videos, So much I want to say was a performance I made specifically for the camera in a slowscan satellite transmission between Vancouver and Vienna in 1983. I also used some super-8 footage shot during the performance Under siege (1982) to introduce an element of chaos into the second part of the video work Changing parts (1984). Also, I totally reconfigured some elements from a complex performance piece entitled Mind the Gap (1986) to create the video work Measures of Distance in 1988. Since then I have produced some video installations that deal with issues of surveillance, like Corps étranger (1994) and a series of installations where I have projected live images and sounds from the street into the exhibition space using a surveillance camera. CVA: The exhibition features a number of impressive installations, which are minimalist in terms of materials and their relationship with space and the spectator. What do these installations represent in your work as a whole? How do you situate them in the minimalist movement? MH: In the large installations I used the grid, the geometry of the cube, seriality and repetition, all of which are formal minimal devices. But when the cube turns into a cage and the grid becomes a barrier, they cease to be abstract since they bring in references to containment, control and ultimately the architecture of the prison. Some of these installations, like Light Sentence (1992), are performative and use light, shadows and movement to destabilise the space. Others, like Map (clear) (2015) use an unstable material, namely clear glass marbles, to transform the ground under your feet into a treacherous surface. So the work is only minimal on a formal and aesthetic level. It is not self-referencial but open to interpretation and often makes reference to the instability and conflict that exists in the world we inhabit. CVA: You also produce objects that seem to be based even more on Surrealism, and which have a distinct touch of humour. Is this deliberate on your part? MH: Humour has always played an important role in my work. I often combined it with a touch of Surrealism to contradict or deflate some of the serious issues in early works such as Roadworks, a performance from 1985 where I walked barefoot in the streets of Brixton dragging heavy police boots behind me, or the 1988 billboard Over my dead body where the symbol of masculinity was reduced to a toy soldier. It is also evident in sculptures like Jardin Public (1993), Untitled (wheelchair) (1998-99), T42 (gold) (1999) and the series of sculptures where I enlarge innocuous kitchen utensils to surreal proportions turning them into threatening room dividers or beds. I am interested in Surrealism because I see it as a visualization of the contradictions and complexities that exist inside us and a way of making art out of one’s inner reality rather than with the logic of our mind. The concept of the uncanny, or of something familiar becoming strange or even threatening because it is associated with some kind of trauma, has often figured in one way or another throughout my work. CVA: Which contemporary artists do you feel closest to? Nafas thanks Christine van Assche and the Centre Pompidou for the permission to re-publish the text, originally published on the website of the Centre Pompidou, and revised for Nafas by Mona Hatoum.